Have you ever visited a city, landmark, or museum and gone on an organized tour? They’re great, of course, because you get to see all of the main attractions and picture-perfect locations. College tours are similar, and it’s nice to be able to see the school’s “highlight reel” up close in person. But—just like there’s way more to New York City than the Empire State Building—there’s a lot more to the colleges you’re touring than the official campus tour sneak peek. Especially with your potential future campus home, it’s basically impossible to really get to know (and fall in love with) a school without exploring it beyond the obvious. A detour into a local store, people-watching in a popular plaza, or taking the time to seek out the hidden jewels that do not receive the attention they deserve can really make your experience. Presumably, you’ve flipped through the college’s view book and clicked around their website before visiting, and the on-campus info session and tour probably only reinforced what you saw there. 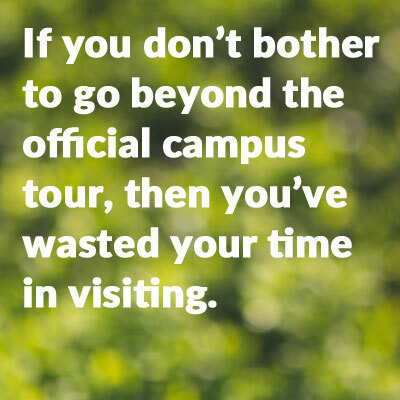 That’s all well and good, but if you don’t bother to go beyond the official campus tour, then you’ve wasted your time in visiting. It is important to get a genuine feel for a college campus and the surrounding town or city, and there is no better way to do this than to really take your time on and around campus. Obviously, nobody can give you a more honest perspective about a college than a current student. If you know anyone attending a school you’re interested in, reach out to them before you visit to get the inside scoop. You can learn so much from meeting up at a favorite restaurant near campus, the dining hall, or even the dorms. Most students, I’ve found, tend to be excited to speak about their college with someone from their old school or neighborhood. You can also be brave and politely ask students you see hanging out in common areas or campus coffee shops what they think about their school. You might be surprised by how willing they are to talk to you! I’ve gone on the long college road trips where scheduling is key in order to get everything done. In those times, there isn’t always an hour or two to explore the college’s surrounding area in a unique way. But there is always time to add one more stop to personalize your tour. I recommend that you stop a student on campus and ask them, “If I could only see one place on campus, where should I go?” Sometimes you'll get the sort of locations you saw on the tour, but students will usually tell you why they find this spot cool, which can help you see what the students really value about their college. 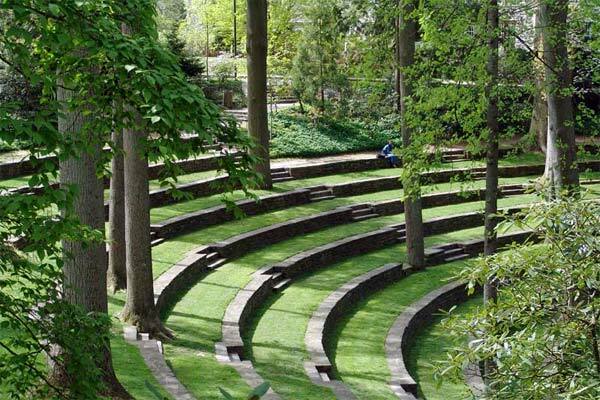 When I was visiting Swarthmore and had missed the tour, I asked a friendly looking student this question, and she pointed me towards the College’s awe-inspiring outdoor amphitheater. This way, I found a jewel I would not have chanced upon on my own and got a glimpse at what students at the college are excited by. I know, it feels like a strange activity to dedicate your time to, but there is really no better way to get a sense of a community. Do the students work by themselves? Do groups mingle and seem approachable? Are the students isolated from or integrated into the community around the campus? These sorts of questions will answer themselves if you find yourself a comfortable spot on campus and take in the way passersby interact. 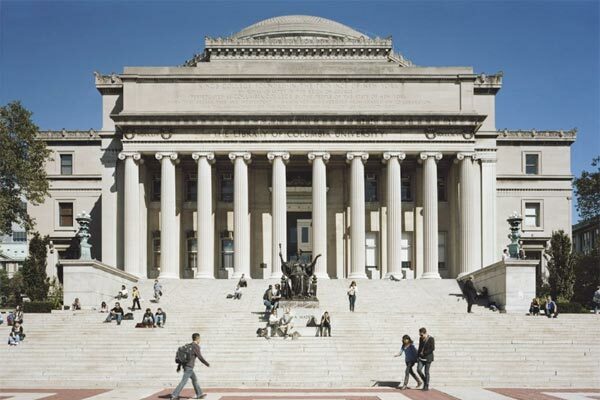 When I was visiting Columbia University, I sat down with my lunch on the Low Library steps and learned an incredible amount about the dynamic of the student body and their role in the city. In the end, it’s key that you devote at least an hour to your “extra” campus visit explorations, beyond the official tour. Talk to students or professors. Visit surrounding shops, restaurants, or museums. Go to a sporting event or performance if there is anything convenient going on at the time. Just explore! It’s definitely worth your time, because there really is no better way to know if the college is a place in which you will truly thrive. Nineveh O'Connell is a committed student, athlete, and traveler. She studied in Spain the summer before her senior year and runs cross-country and track for her high school. She looks forward to college as an opportunity to apply her hobbies and interests to her academic life.